See Bolton (1995). A pan-global tramp species . Emery's (1890b) description is at . 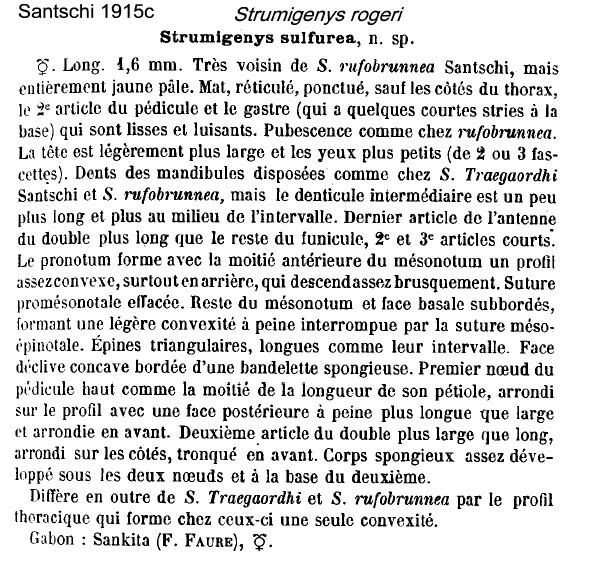 Santschi's (1915c) description of sulfurea, gives TL as 1.6 mm - . Brown (1954k: 20ff) gave notes; these are at and . Bolton's modern description (1983) is at . 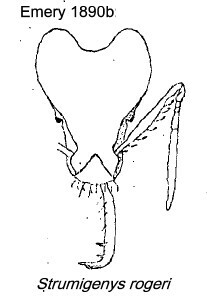 WORKER - TL 2.3-2.8 mm; strongly developed pre-ocular notch extending on to ventral surface of head; simple dentition, long straight mandibles; long antennal scapes; upper scrobe margins indented and no flange; Colour dull yellow to light medium brown (Bolton, 1983: 387, illustrated full-face view and head profile). Note African specimens are much darker. Emery gave the colour as "testacea", testaceous = reddish-brown or brownish-yellow hue of bricks. 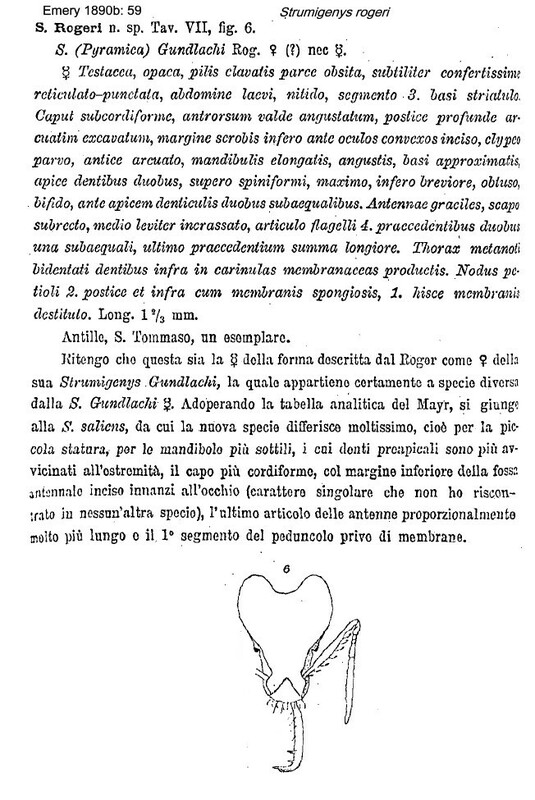 The photomontage of the holotype is collated from http://www.antweb.org/specimen.do?name=casent0102080. 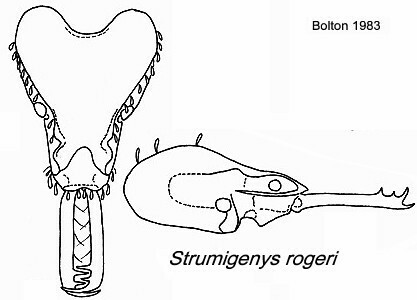 From Nigeria, listed by Bolton (1983) as a species which he collected at CRIN. 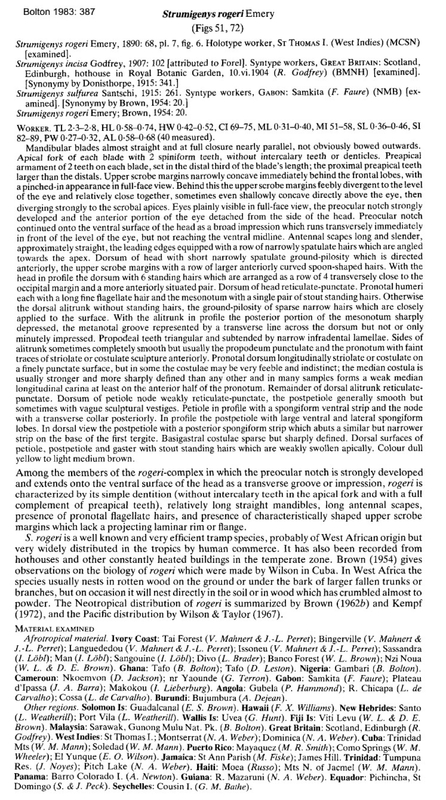 Ghana records include CRIG (B. Bolton; D. Leston). 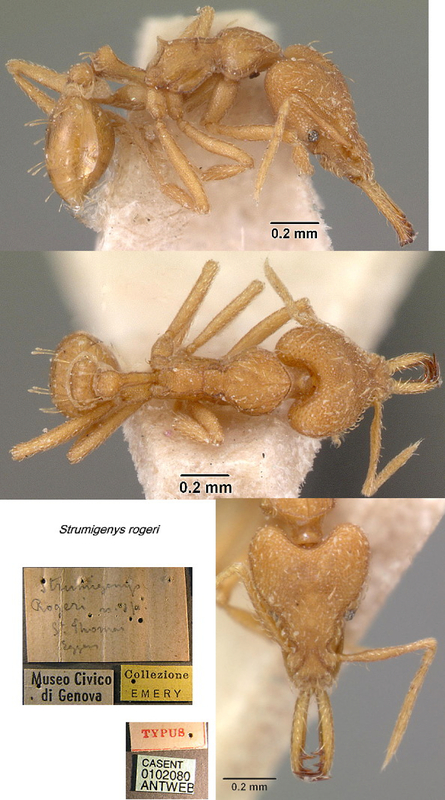 Since described as widespread, from their leaf litter samples (177 workers from 6 sites) in the semi-deciduous forest zone by Belshaw & Bolton (1994b). Ivory Coast records included Bingerville, Issoneu, Languédédou and Tai Forest (V. Mahnert & J.-L. Perret); Man, Sangouine and Sassandra (I. Löbl), Divo (L. Brader), Banco Forest and Nzi Noua (W.L. & D.E. Brown) (Bolton, 1983). In Cameroun, at Nko'emvon (D.A. Jackson) and near Yaoundé (G. Terron); also from Gabon, Angola, and Burundi (Bolton, 1983). The photomontage is of a specimen from Gabon, Pongara National Park, Camp Base; collector Yves Braet (Gabon 175), 2006.